What sits behind this door in our kitchen in our itty bitty laundry room. If you read yesterdays post, you will know I am on an organizing kick. I decided to utilize the back of the door. Originally I was going to do a gift wrap station here, but I needed the storage more, and I'm glad I went this route. I went to Home Depot and got a door rack for around $37. Best $37 I have spent in a long time! Before I hung it up I painted the door with chalkboard paint. "I can't clean the tub because I don't know where the cleaner is!" Inside the door is a wall of lockers I got at a garage sale for $25!!! I used my label maker of course, and went to town on each of the 24 doors. There's even a stool in there so the kids can reach everything. I do keep my boots in here because they are usually covered in mud. To the left is the stack able washer and dryer and to the right is important stuff like, kitchen fire extinguishers. Never had to use them yet, but ya never know! Spare keys hang on a key rack and are all labeled, and batteries are hung and are easy to find. The other stuff is just the electrical panel and generator switch. Can you believe these were $25??? It took 6 neighbors to haul them in my house. And that my friends our my teeny tiny laundry room! I will pick 3 random people who comment on this post to win a Febreze laundry kit. The kit is filled with must-have laundry taming tools like a coupon for free Febreze Laundry Odor Eliminator, an official guide filled with tips and advice for the freshest laundry, a Febreze towel and a Tide Odor-Absorbing Travel Laundry Bag! I'll announce the winner on Friday along with the Annie Sloan Paint winner! Really Love that! my mom also has a verrry small laundry room but makes the most out of the space with a little 3 net laundry sorter from walmart for about 30 dollars and an old cabinet my dad put together! Would love to win that package for my mom she's so sweet and Loves doing laundry! And once again I must say I just adore your home!!! Those lockers were definitely a score!!! Love what you did with the door! LOVE the lockers -- and that door rack. Looks like it would hold a lot! 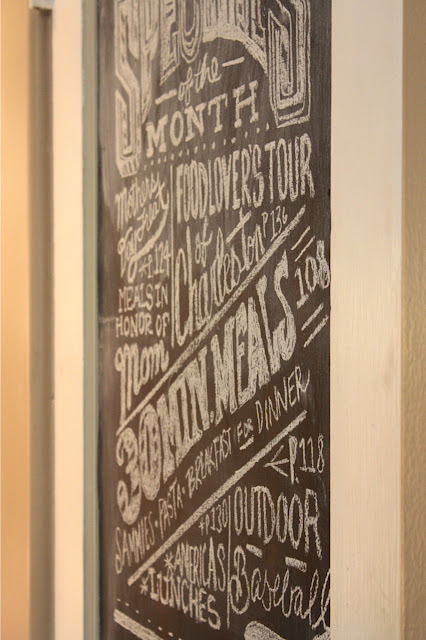 I want to paint.everything with chalkboard! I also have lockers! And think I might put a set in my washroom! Those lockers are amazing....super jealous. $25 are you kidding me???? What a find! I would love to run across some of those. I have a very tiny laundry room and you've given me much needed inspiration. Since I will never find those great lockers at a garage sale by me, I will go and get the door organizer! My "kids" (all over 18) still can't find the right cleaning products! 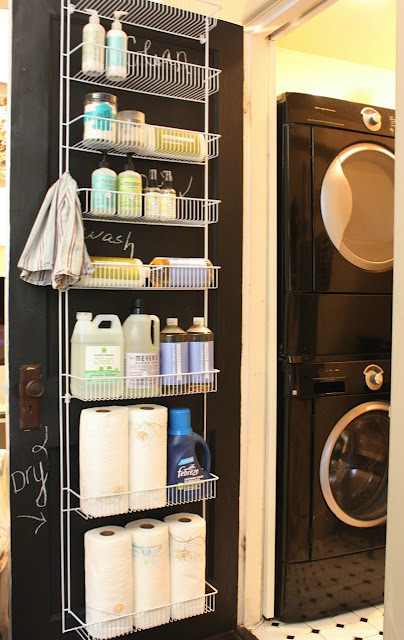 Love your little laundry room. 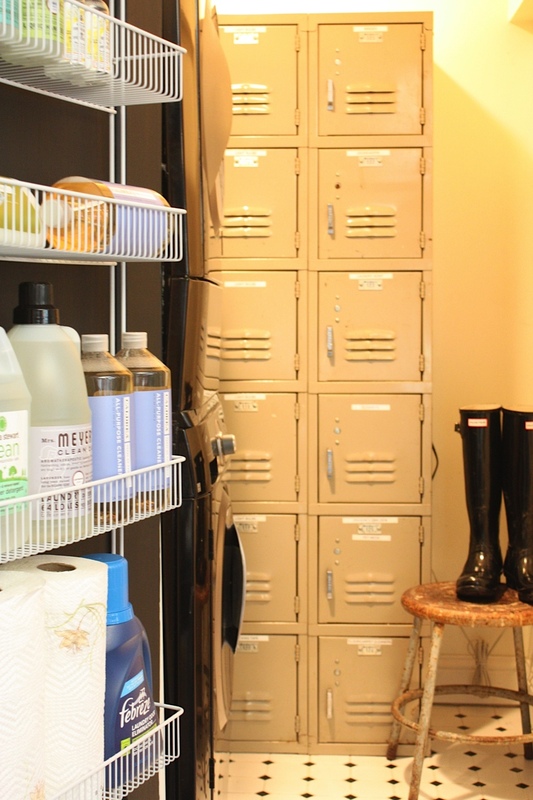 My whole house is 500 sq feet, so I need to be really organized as well! Love the over the door rack thingy from Home Depot. Will have to get me one of those! It's so beautiful and functional at the same time. Your laundry room is full of storage space! I love it! Looks amazing! 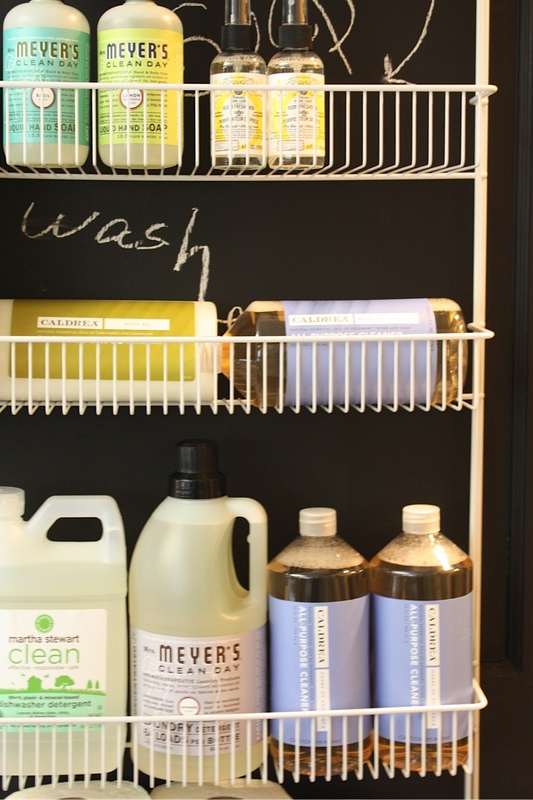 What are all the cleaners you use and prefer? Thanks so much for the inspiration I have just made a chore chart that I just started using. Its working well, keeping me on task! Love your lockers. Brings back such memories. Enjoy your tidy home!!! I am a sucker for pretty packaging too. I love Mrs. Meyers' products as well - especially the basil - and I too am a sucker for great packaging!! Its what sells a great product, too. You've done great with your small space. Wish I had those lockers. What a great idea! I have a very small laundry room too. Nice to know that I'm not the only one. ha! I think you've done a great job making the most of your space though. Oh my again!!! You are so organized!! I want to have your energy!!! And, I am such a fool for any packaging - I'm a visual girl and that is right up my alley. And the Meyers' products... another issue with me!!! Put me in the hat for the Febreze package, and I would love to have you come organize my house as well!!! Love your blog!!! Oh you did an amazing job with that score of the awesome lockers. Thank goodness for great neighbours. Congratulations! Very nicely done! Lockers are so cute. Lucky find! Love love LOVE those lockers! what an awesome deal! And your over the door organization is such a great idea!! It all looks wonderful!! I love the idea of lockers as storage. but unfortunately do not have space to put them, although maybe they would in my kitchen or mud room. OK now you have me thinking of the possibilities. I am such a DIY dork. You are an inspiration! My laundry room is a DISASTER! I am actually taking off 2 weeks from work to organize my house and yard, can't wait! Nothing better than the fresh scent of clean laundry! Love your door idea, I just might steal that idea! So cute! You have every corner of your house decorated so well. Love the lockers! Love the lockers! Great idea! I too am a sucker for pretty packaging! Where are the other 12 lockers hidden? Love Meyer's! Especially the surface cleaner, mmm lavender! 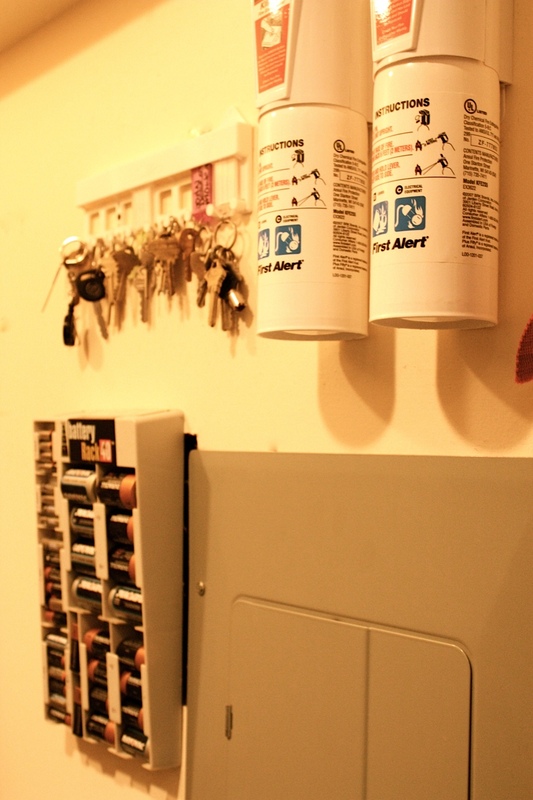 Loke your door solution and the lockers are a steal! You neveer cease to amaze me. And motivate me. Looks perfect. Love the lockers and your "chalked" door! don't love the word verify! Love the makeover, very cool! That is ingenious. I love those lockers. Thanks for the giveaway. Shut the front door......25! I’m so jealous right now! Oh wow, love that door & those lockers. Fabulous!! That rack is awesome too. Great ideas. Pick me! I'd love to win!! P.S. I'm jealous of your lockers been wanting some since high school when I heard they threw out a whole bunch one summer. I really like the door organizer. This is such a genius idea, I love it!! Awesome and SO, so organized! I have to find some lockers! Thx. Love it all! Those lockers were quite the find!! Love the lockers. I redid a set I got from Craigslist. I sprayed them antique white and then buffed them with a sander. Then work was getting ready to throw theirs in the dumpster so I took those home for free. Getting ready to redo them as well and put in my shabby booth downtown. Thanks for the chance at the giveaway! Love the view of a tiny laundry! We just move into our new house. I will be looking for battery rack to hang like yours. Wonderful ideas! thank you so much! Those lockers are super cool! Smart thinking with the chalkboard paint!! A DOOR RACK? That is awesome. Pinning if ya don't mind. I would like to go to the garage sales you go to!--$25 for those lockers is incredible! Qrganized & pretty packaging--a winning combination! Those lockers are perfect! Totally meant to be a part of that wonderfully organized space! I love that packaging too. Worth every extra cent. 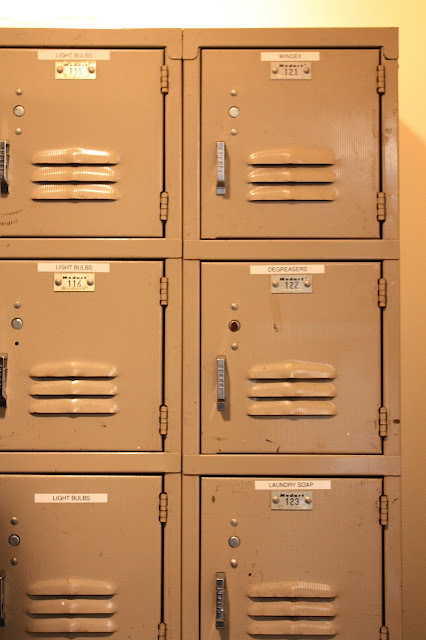 I love your lockers - I have some too! You are getting me motivated for spring cleaning over this school break. You have such great ideas. Love your idea! Wish I had some laundry space. I just have a door that opens to a stacked washer & dryer. P.S. Thanks for the giveaway and I am wondering if you like your Hunter boots? Do you have the original Tall ones? I have been wanting a pair for awhile now but it seems like there are a few different options. I'm am going straight out and picking up an over the door storage rack! What a good idea! ps. love your lockers, super cute! The rest of the lockers are hidden in the photo behind the washer and dryer. They are still shallow enough to utilize. Love my Hunter boots! They are the shiny original tall ones, I want another pair! I just saw pink ones, might have to save up for those! I have to give credit to my good friend Michelle who actually found me those lockers. She called me from a garage sale and said, hey, you want some lockers, they are a steal but I just don't have the room for them! She's awesome that way! When I went to pick them up the guy running the sale said he could have sold them 50 times over for 3 times that amount! It was my lucky day! Here's a tip: I frequent TJ Maxx and look for their cleaning products and candles at a lower cost. I got all my Caldrea products there for about 1/2 off. I also get a lot of it at World Market using a coupon. Just a little tip! Thanks again for all your comments! I love your door rack idea. 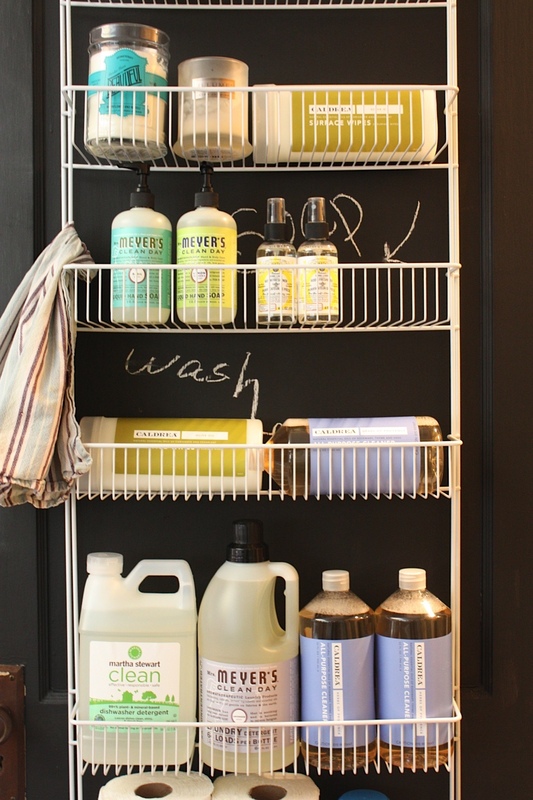 I would of never of thought of that for laundry/cleaning supplies. Our area seems to be the "under the sink" option. You are one lucky girl to have stumbled across the lockers! Love them! aka DAD and MOM Chipley!! I am sooo going to get that door rack! My laundry room is out of control!!!!!!!! 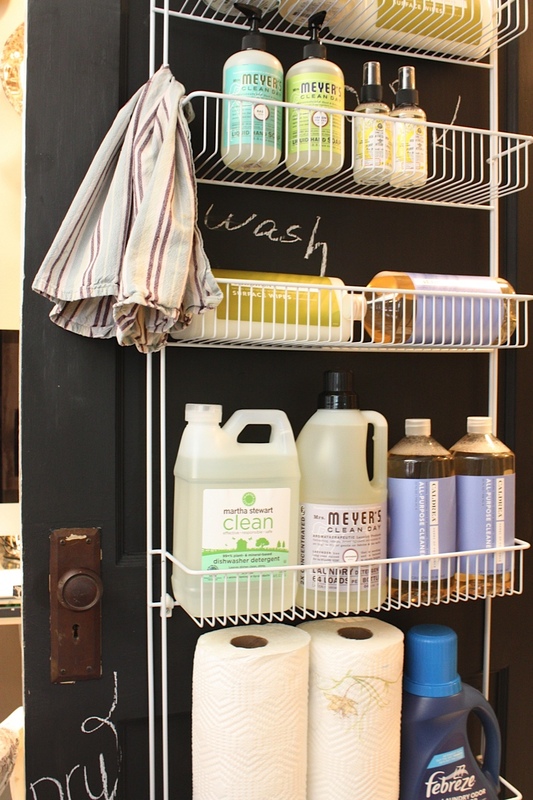 Okay, the laundry room door has got to be THE cutest and creative idea ever. Love it. You are seriously SO creative. The chalkboard background is my favorite....plus the lockers, which is a given! I am in the need of febreeze! Thanks for the chance to win! oops! the smelly winner forgot to leave her e-mail!! Love it! Where did you find those battery racks!???! Our Home Depot slab wood doors here all start at $98! You got very lucky with that door! How did you retrofit that old knob? Those lockers are fantastic! Now I know what I could do with them if I find them in my travels. Hello, could you please share the rack type with us? I'm guessing maybe closet maid? 37 dollars is a steal the other one similar I found was almost 90! Would love to find out what type you are using! Thanks! Did you get the laundry room door hanging rack in canada or in the us? did u buy the laundry room rack in canada or the us? Where did you find the battery storage container? My kiddos are ALWAYS getting into the batteries for toys and the wii. I want a door rack so bad! I searched Home Depot online and can't find it. :o( Do you remember any brand name from it? Maybe I could find one searching for the actual name of who made it. Thanks for sharing...love the pics! Are the washer and dryer full size? I currently have FULL size on pedestal b/c of back problems but my laundry room (stupid builders - ha ha) is so small you can barely move in it. Definitely need some space saving ideas. Thanks for sharing this post. Storage racks are considered to be one of the most useful items available in the market and can be used for storing different kinds of commodities and equipments. Since laundry is one of never ending household jobs, you need to manage it well. One Stop for All Your Laundry and Dry Cleaning and Alterations Needs!!! Thanks for sharing this post. Storage racks square measure thought of to be one in every of the foremost helpful things on the market within the market and might be used for storing totally different varieties of commodities and equipments. how did you get your washing machine and dryer on top of each other. Online betting and satta games have become the trend of today’s age and large numbers of people try their luck in this game. Though the entire game is based on how fortunate you are but many websites and seasoned players claim to leak satta number. Now the question arises if the satta number gets leaked satta king then why should I put my money on to the satta games? It is natural to believer for any beginner to think this way and may feel cheated with such whistleblower activities. Whatever business you ultimately choose to start you've got to seriously consider what you are likely to be doing and most of all have an exit plan if all fails. 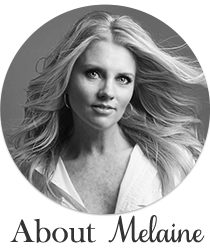 Click here for more interesting information on About - Laundry Owner.